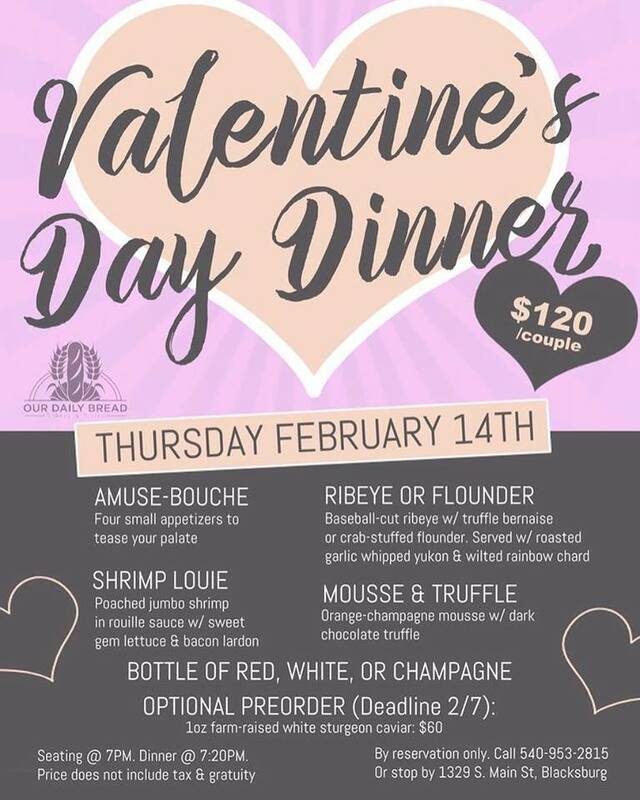 Our Daily Bread Bakery & Bistro presents their 2019 Valentine's Day Dinner on Thursday, February 14, 2019. Enjoy a special four course Valentine's Day Dinner complete with your choice of a bottle of red or white wine or champagne. The cost for dinner is $120.00 per couple and does include tax and gratuity. An optional pre-order of 1 oz farm-raised white sturgeon caviar is available for $60.00. The deadline for reservations is Thursday, February 7th. To make a reservation, call 540-953-2815 or stop by in person. Seating will begin at 7:00 pm and dinner service will start at 7:20 pm. To view the event flyer, visit: https://i.imgur.com/a2hmFe2.jpg. For more information, visit: http://www.odbb.com/ or https://www.facebook.com/ODBBlacksburg or call 540-953-2815.